This Classroom Volunteer Resource will help you by providing an already made handbook and observations forms for you to change and make your own. If you do invite family members or student interns to volunteer in your program, there is much to consider! Having classroom volunteers in your preschool program is a great opportunity for a preschool program! You can read more about it on my sister site, Preschool Director. Having a Parent or Student Volunteer Handbook helps you to let your volunteers know, from the beginning, what to expect when volunteering and what they are and are not responsible for. This digital packet contains a completely editable Handbooks, Observation Forms and an Evaluation Form. There are also informational pages to help you to use the handbook, observation forms and the evaluation form. 22 page digital packet with informational Volunteer tips and 10 completely editable pages including handbooks, observation forms and a student evaluation form. 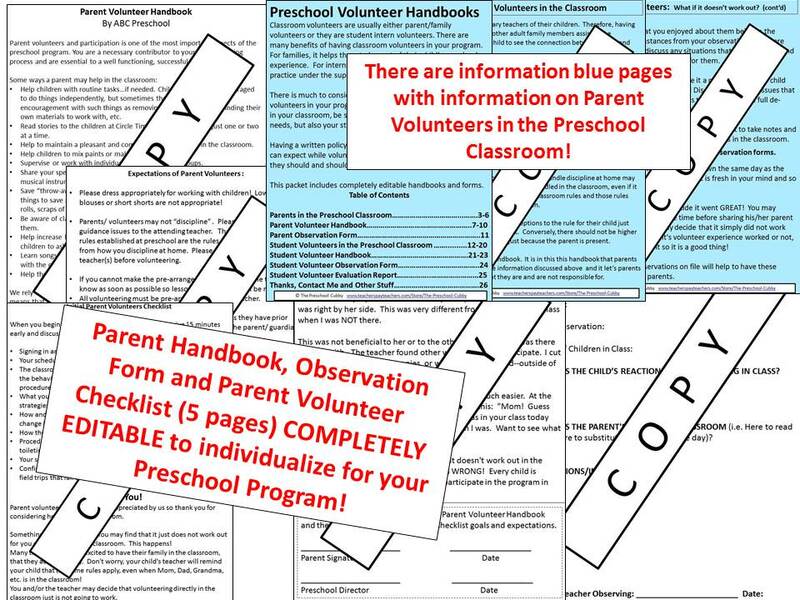 This Preschool Volunteer Handbook Packet is for anyone who utilizes the help of Parent Volunteers or Student Intern Volunteers in their preschool program. This 22 page packet includes 12 informational pages that provides information and considerations for classroom volunteers as well as for using the forms and handbook in your program. It also includes 10 COMPLETELY EDITABLE pages (the actual handbooks, observation forms and an evaluation form) for you to individualize to meet the needs of your preschool program! A 4 page, completely editable Parent Volunteer Handbook. 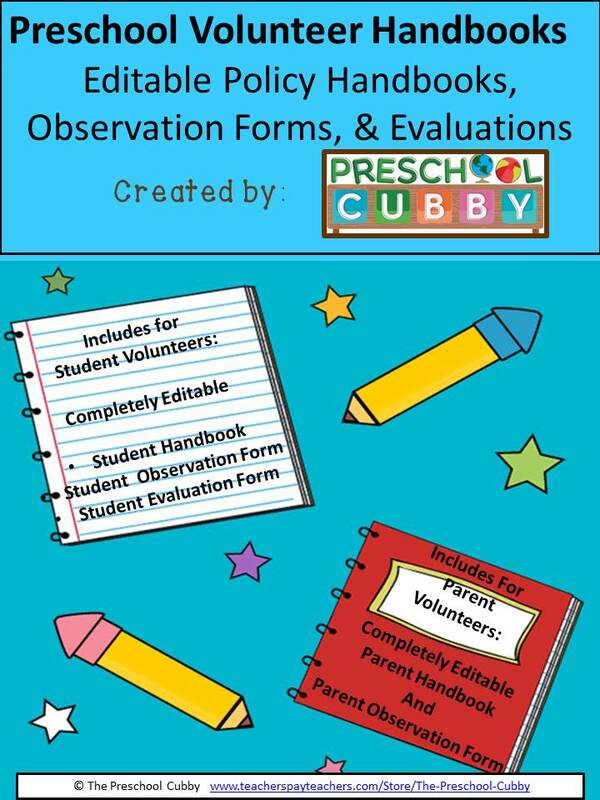 A completely editable Parent Volunteer Observation Form. 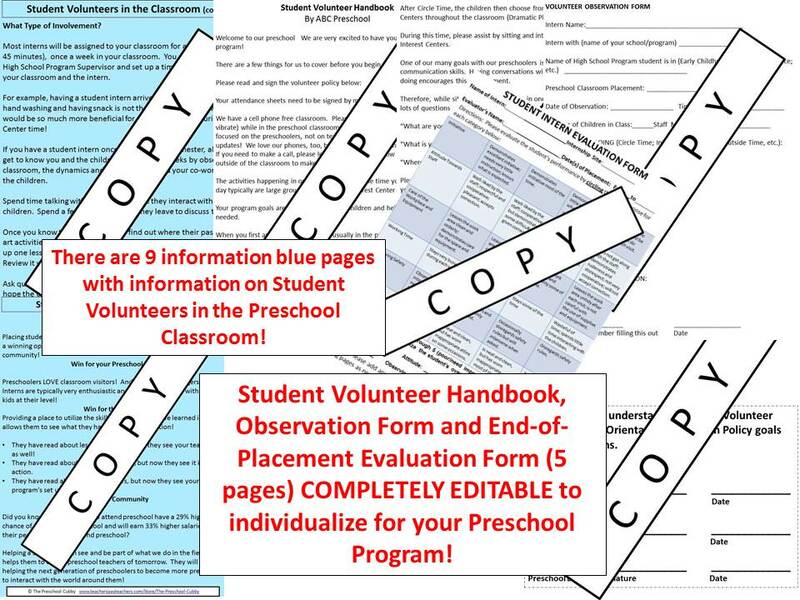 9 Informational pages discussing Student Volunteers in the Preschool Classroom. A 3 page, completely editable Student Volunteer Handbook. This packet is in Powerpoint format.